Junior League of Youngstown members recently volunteered at The Red Door Cafe at St. John’s Episcopal Church. 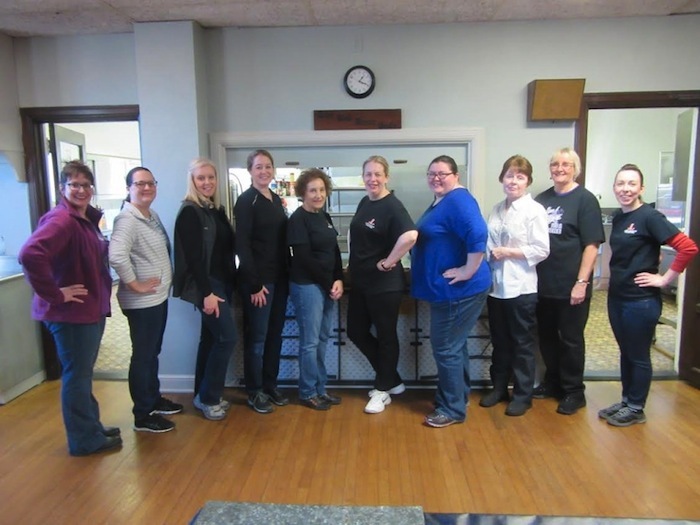 Kelly Frammartino, Beth Drennen, Deborah Hartig, Amy Banks, Elizabeth Kijowski, Mercia L. Stevens, sustaining member Carrie Zapka and four volunteers, Margie Hartle-Rassega, Donna Marsolo, Nichole Blaze and John Frammartino helped prepare and serve 74 meals. Members and volunteers prepared sloppy joes, macaroni and cheese, green beans and desserts. Nancy Kearns Morris, past president of the league, co-founded the soup kitchen at the church. The organization is committed to building better communities, developing the potential of women and club members and promoting volunteerism. Above, from left, are Hartle-Rassega, Zapka, Blaze, Drennen, Hartig, Banks, Kijowski, Stevens, Marsolo and Frammartino.